Vibrant Family Room - Grace Home Design - Eclectic - Living Room - Other - by FRAME design co.
Where can I get these mustard chairs (or very similar style)? - I agree with Christa, where are those awesome mustard chairs from? Aren't they leather? I purchased a very similar chair from Kasala in Seattle. Only $200. And the rug, from Wayfair. Where is that gorgeous coffee table from?! I'm lovin the couch. Where is it from? Thanks! The couch is from Ted Boerner. Rug - Where did you find the rug? Fun fun fun! Hi! The rug is from Madeline Weinrib. Paint - What color is wall paint? It's frustrating that wall color is rarely included in these designs! This paint color is from Divine and it was called Seaglass but is no longer available. There are two other colors from Divine that are very similar to what this wall color is which are Breeze or Koala from the Ocean Tide Pools Collection. Hope this helps! Painting - Who's the artist? Andy Warhol. Home Owner's personal collection. Andy Warhol "Cowboys and Indians Series: Plains Indian Shield". We have sold these several times in the past. where is this rug from???? I love the chairs! Do you mind sharing who makes them? Thanks! Precedent makes these beautiful chairs. I love the mustard upholstered chairs, can you tell me where they are from? Thanks! 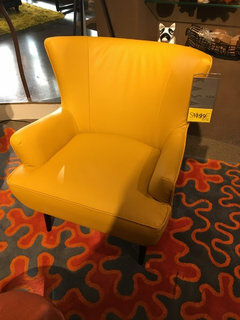 Here's a room where the color of the EroS makes it stand out along with the other pops of yellow.As for its form, the nonswivel version of the chair sits atop an Eiffel base. The precedent for this base is that of the Eames Shell Chair. 5. Rolling furniture can redesign a space quicklyWhether your space is modern or vintage, there is a rolling piece of furniture for you! This little chair on wheels is a perfect solution for this space. 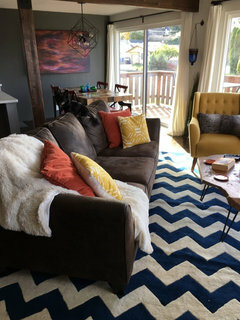 Sitting on the corner of the area rug, it offers seating, but doesn't break the view of the chevron rug. 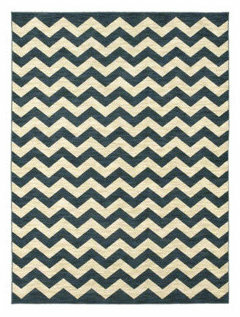 When it is not needed, the chair can easily be rolled away.Want to make your own chevron patterned rug? Check out this tutorial. 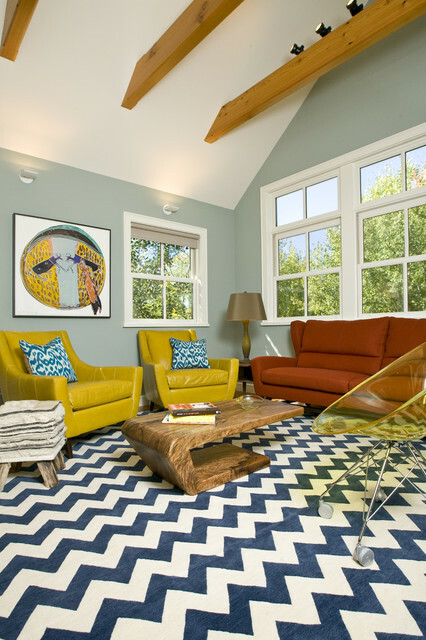 Zany zigzags, a mod acrylic chair, an asymmetrical coffee table ... could this room be any more fun? Mod furniture and accents help to make a classic color palette feel new all over again.